What inspired you to start “The Pink Pom-Pom Project” and where did the catchy name originate from? I was diagnosed with Stage 2 Breast Cancer in October 2010 in London, UK. After the initial shock, horror and reality of my situation, I had to be a realist and get back to being a Mommy first. My kids were young and did not understand, let alone would not stand for mommy sitting or laying around the house. As cancer treatment goes, my chemotherapy sessions quickly started after surgery in November. My hair began to fall out in clumps everywhere I went: in the mall, in the shower – it was disheartening however, I had my three kids to look forward to, especially their beautiful smiles! Chemotherapy is not doubt horrible and sitting alone in the sessions is even worse. I am an eternal optimist and always try the find the good in every situation. So I would walk around the clinic trying to talk to people, but none were interested. I was so bored even catching up on sleep was boring! So I started to blog and knit hats and scarves for other cancer survivors. One chilly afternoon in London and in my cozy room after chemo, I began to shiver. Women do not realize when your hair is gone, life can be freezing! So I started knitting a hat for myself. “The Pink Pom-Pom Project” was named after I had knitted my own ‘floppy cancer hat’ and popped a huge pink pom-pom on top. My girls came into the room and cheered when they saw it. I asked if they would like to learn how to knit to help make hats and scarves for others. They both agreed and asked if we could call it “The Pink Pom-Pom”, I added the “Project” and three weeks later we were applying for a trademark! I’ll say the PPPP came in the nick of time because my cancer treatment was a rough one. I had been hospitalized four separate times, other than surgeries even on Christmas morning and Valentine’s Day! We started the PPPP in London and we moved to the United States in December 2011. I opened my first physical shop in February 2012 and started our very first “Stitch & B*tch” group soon-after. These sessions take place every week on Monday and Thursdays. We try to help every woman we can in any way during cancer treatment and afterwards by providing art classes as a means of emotional therapy. In two and half years, we have connected with seven different organizations through Fairfield County and work with cancer survivors and inner-city youth. We teach arts and crafts and life skills, i.e. knitting and sewing to children ages 7 years+. 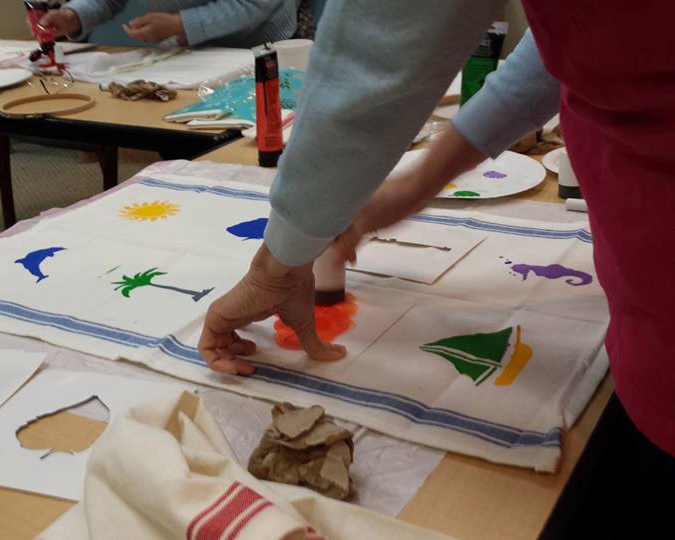 What are the benefits of crafting for patients undergoing cancer treatment, or for cancer survivors, and what’s it like at one of your “Stitch & B*tch” groups? When I was undergoing treatment – and I had mentioned before how boring chemotherapy can be – arts and crafts got my mind off my current situation. It helped me escape into a world of creativity. It was especially fun because between chemo sessions I would hold “Stitch & B*tch” parties at my home. 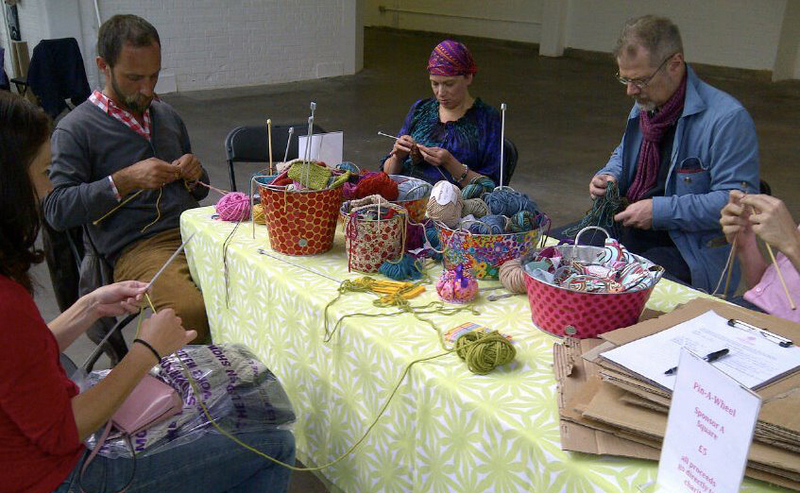 We spread to crafting because a lot of people did not know how to knit. And I always provide instruction at all group sessions in case any one wants to learn, or has any issues. “Stich & B*tch* is fun and productive. We’ve also started introducing other projects, like lavender sachets as sleep aids and small quilts. When women in need get together, it’s amazing how powerful just talking and sharing can be. Especially to someone who may have trouble expressing themselves or who is completely overwhelmed with fear by this disease. 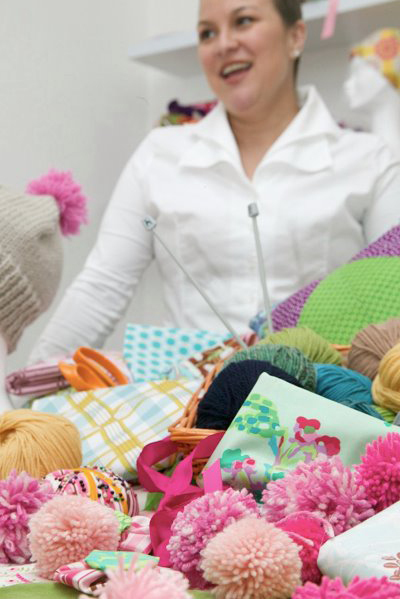 Your shop, “A Little Square” in Fairfield, plays a direct role in helping support “The Pink Pom-Pom Project”. Where do these two ventures overlap and how are they different? ”A Little Square” was started in London when I arrived pregnant with my second child. It was first a hobby. I would import hand-painted baby clothing and accessories by my twin sister, Shepherd. There were no cute preppy Americana gifts and baby stuff that was affordable for everyone to enjoy. Everything was too expensive, especially when you have to purchase ten gifts for all your new mommy friends! “A Little Square” has been in business since 2005 and was mainly a home-run/trunk show business for the first year. It then expanded to gift shows and became known as the Americana Chic Gift store – apparently I found a niche and it was fun while it lasted! Now “A Little Square” serves an even bigger and better purpose. It currently underwrites “The Pink Pom-Pom Project” and provides supplies, materials, equipment, and instruction to the groups we work with all for free. The PPPP prides itself on providing the same classes to under-privileged children. One of its many mottos is ‘Why take a child to K-Mart when you can take them all to Coco Chanel’ – the playing fields should be the same! When you shop at “A Little Square” you are directly giving back to the local community. It’s a ying-and-yang kind of charity! 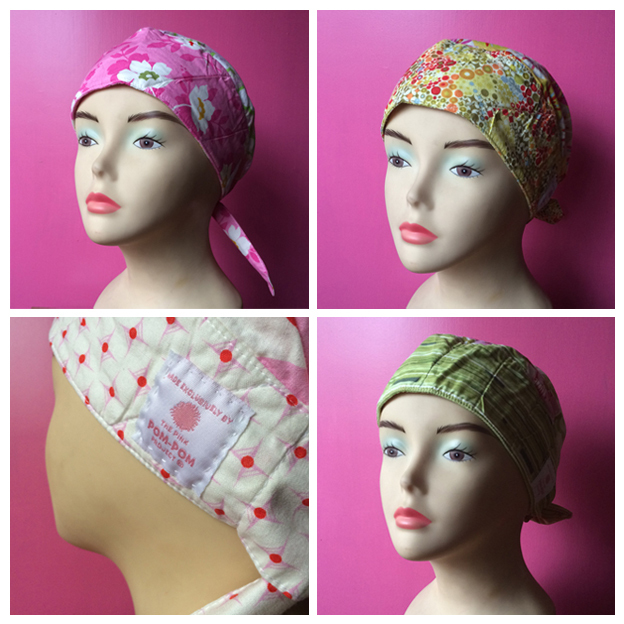 The headscarves you make are not only beautiful with uplifting colors, but also very practical and comfy. How did you draw on your own experience to design them and what other items have you designed for patients? I grew up in the 70’s and my mother’s hair started thinning after having six kids. So she made this amazing scarf that she would wear almost every day of the summer. The design of our scarf is completely based off her own design with extra padding in front to give the illusion of ‘hair’ for patients. The crown part is slightly poofier too because when you are undergoing Chemotherapy, although you may be cold or hot, the skin on your head must breathe. Because in spring it’s too hot to wear hats and beanies, we patterned our scarf in bright-colored fabrics designed by very talented textile designers, like Amy Butler, Heather Bailey, Kaffee Fassett and many more. In terms of designing other products, we make other things like Lavender Sachets, Prayer Shawls, Hats and Scarves, PPPP Pillows and now, thin Cotton Quilts for Chemotherapy. How many women do you work with/have you worked with on making these headscarves (and other products for patients) and what are some of the reactions of the patients who’ve received these lovingly-made gifts? I would say from the time we started The PPPP crafting parties in 2011, easily 400+ people. We not only work with women undergoing treatment, but their families participate as well. We also work with The Girl Scouts of CT. We schedule GS Troops, many groups come between 13-20 kids, and they make Lavender Sachets for cancer survivors [to aid in sleep]. We also ask the children from our community centers to help make the Lavender Sachets. My favorite part is the reactions from everyone involved. From the moment we start a project, I explain to groups about our charity and why they come together. When everyone understands the project, the excitement builds and goods get made faster! It’s really sweet. We have a program called The Volunteer Of The Year (V.O.T.Y.) Quilt, which is made exclusively by cancer survivors for a dedicated volunteer in a cancer clinic. Their reactions are priceless because they never expect anything back! 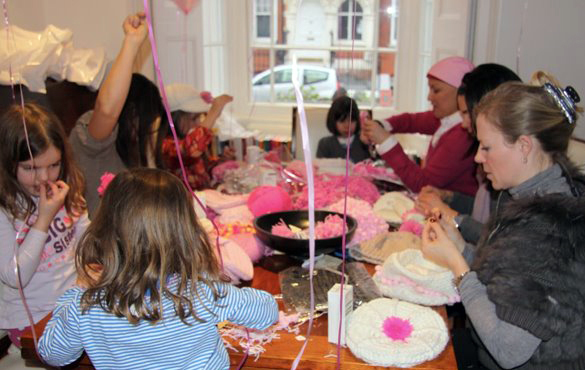 You founded “The Pink Pom-Pom Project” while living in London and now you’ve expanded your reach to the U.S.A. Where do you see the charity heading next and what exciting projects can we expect in the future? Well, that is a good question! Because 1 in 3 will get cancer in the US, it is imperative we reach out into other communities and establish the PPPP as an optional therapy tool. I have always thought franchising was a possibility. I have been asked by other hospitals to come and share, that is on the agenda! However, for the remainder of 2015, we have a very exciting project that will take The PPPP into a whole new direction. We are sponsoring Art Rooms within the inner-city youth community centers we teach at. Our very first Art Room will be at The Cardinal Shehan Center in Bridgeport. We will be redesigning their space, providing new options for art, especially offering Sewing Classes as an important life skill. Their current room is a little out-dated and needs a new bright look to encourage creativity. We are really looking forward to it! “The Pink Pom-Pom Project” donated more than 25 headscarves to our organization last month (June 2015) to be passed on to patients in Lebanon. We are beyond touched by this very kind and generous gesture. What message do you hope to send across to the patients who’ll be receiving them? There was an angel in my mist after I was diagnosed. After the initial diagnosis, I was in shock but I did not want to strike fear in anyone else. I could not walk, my legs would not support me. I was devastated and could not see the future, I could not see my life, I could not see my children. While I waited for the final results, a young woman walked in to the room I was waiting in. She was not a counselor or a Doctor: she was a Secretary in the Accounting Department. She said these two magical words to me “Six Years”. For a moment, I did not understand what she said. I assumed after diagnosis I was headed for the crematorium: life was over for me. So I stood up, wiped my face and tears away and said she was right. The fear subsided for the moment and I walked out of the clinic with a whole new perspective on life. That young woman saved my life. Cancer saved my life as I watched the days drift away with frivolous activities that meant nothing to me or anyone else. Now I look at everything and live every day to the fullest. I pay it forward by working with people who need help. This is my therapy and I hope you can help someone else in their journey back to health. others in their journey back to health. I would encourage women to make things for newly-diagnosed women because it would really help lift them up during this phase. Thank you and God Bless! We’d like to take this chance to thank Alexandra, her team and everyone who’s worked on the headscarves through The Pink Pom-Pom Project for donating these gorgeous headscarves to our organization. The patients that have started receiving them as a result of this kind gesture absolutely love them! * Feeling inspired to do something to help patients here too, but don’t know what yet? Or maybe you already have an idea but don’t know how to make it a reality? Get in touch with us and we’ll find a way!